Computer engineer J.J. Garcia-Luna-Aceves has been appointed to serve as the UC Santa Cruz director for CITRIS (Center for Information Technology Research in the Interest of Society) and the Banatao Institute, effective July 1. Garcia-Luna-Aceves is the Baskin Professor of Computer Engineering in the Baskin School of Engineering at UC Santa Cruz. As the CITRIS-UC Santa Cruz director, Garcia-Luna-Aceves will be responsible for directing operations and ensuring that the CITRIS mission is carried out at the campus level. As a major contribution, and in collaboration with the other campuses, Garcia-Luna-Aceves said he hopes to launch a new CITRIS initiative focusing on cyberphysical systems and the “Internet of Things.” His goal is to establish a research center headquartered at the UC Santa Cruz Silicon Valley Campus, which will include participation by the four UC CITRIS campuses—Berkeley, Davis, Merced, and Santa Cruz—and will integrate industry participation and sponsorship as key elements. 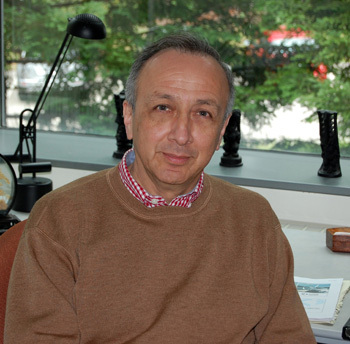 Garcia-Luna-Aceves’s own research focuses on the principles of computer communication, wireless networking, mobile and pervasive computing, information-centric networks and cyberphysical networks. He said our society is at an inflection point in computing and that without a radical new approach to security, we are putting ourselves at an escalating risk for privacy breaches, fake news, and other serious security infractions. “We need to be able to trust the data, even if we can’t trust the participants or the container that holds the data,” he said. Garcia-Luna-Aceves said he is looking forward to enhanced collaboration between UC Santa Cruz faculty and colleagues across the CITRIS organization, not only through a new initiative, but also through existing CITRIS initiatives, which include healthcare, human-centric robotics, sustainable infrastructure, and connecting communities through technology. “Garcia-Luna-Aceves said he sees CITRIS as an amplifying force. The combined expertise of four UC campuses working together in conjunction with industry partners could lead to positive societal impact well beyond the sum of the individual parts. The presence of a UC Santa Cruz campus in Silicon Valley will further help to establish a CITRIS presence there, he said. CITRIS and the Banatao Institute drive interdisciplinary innovation for social good with faculty, researchers, and students from four UC campuses—Berkeley, Davis, Merced, and Santa Cruz—along with public and private partners. By addressing society’s critical challenges—designing sustainable infrastructure, advancing human-centric robotics, modernizing healthcare delivery, fostering civic engagement, and more—CITRIS and the Banatao Institute are helping shape the future of technology. Garcia-Luna-Aceves received his B.S. degree in electrical engineering from the Universidad Iberoamericana in Mexico City and his M.S. and Ph.D. degrees in electrical engineering from the University of Hawaii at Manoa in Honolulu. He is a distinguished professor of computer engineering at UC Santa Cruz and holds the Jack Baskin Endowed Chair of Computer Engineering. He is a corresponding member of the Mexican Academy of Sciences and a fellow of the ACM, IEEE, and AAAS. He joined the UCSC faculty in 1993.